Regular links and task URLs referenced in a task's description or comments are automatically recognized and stored in one convenient location on each task. Task URLs are unfurled and automatically create a connection between the task you're viewing and the mentioned task. Simply type ## in a task description or comment field to reveal the new task selector. Choose a task to "unfurl" it right into the text field. This selector completely replaces the need to copy and paste! 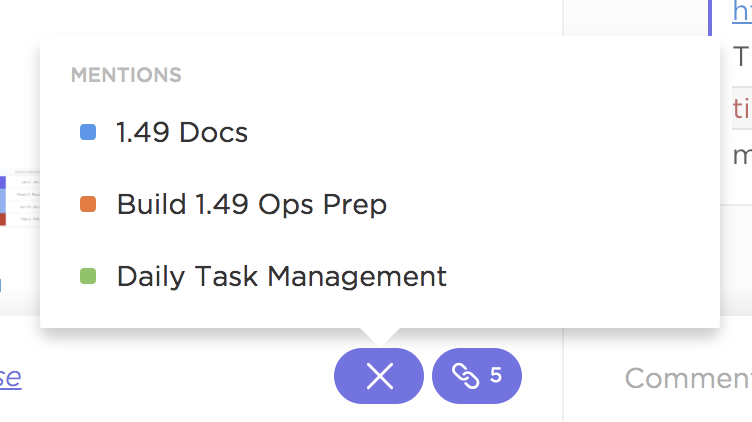 Task links provide ample utility by allowing you to see a task's status, title, and ID in a well-defined mention. When you mention a task in another task, linking occurs behind the scenes. Now, when you go back to the task that has been linked to, you'll find a mentions area in the bottom of your task window. This counter shows how many other tasks link back to this task. You can click to expand the list and quickly jump to each linked task. Link tasks that are "blocking" or "waiting on" other tasks with dependencies. Be sure to check out our other shortcut and hotkey options!